This Concept Map I created depicts a cross-curricular unit based on Swing dancing. 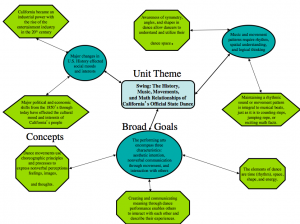 The unit included history, music, movement and math relationships, all corresponding to fourth grade California content standards. Students ages 9-14 use this peer critique worksheet to discuss successes and challenges in their video projects, as related to the 10 Elements of Digital Storytelling. 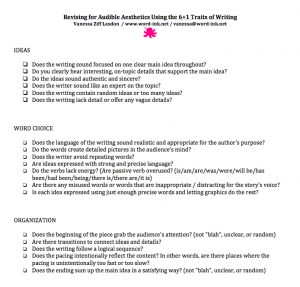 Advanced Students in Digital Storytelling use these revisions techniques based on the 6 Traits of Writing to revise their video projects for audible and visual aesthetics. 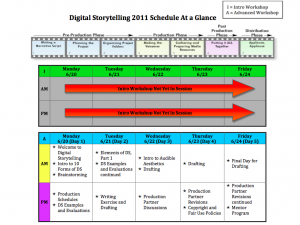 Take a look at a complex schedule I created for concurrent Intro and Advanced Digital Storytelling Summer Workshops. We really maximized our learning time! 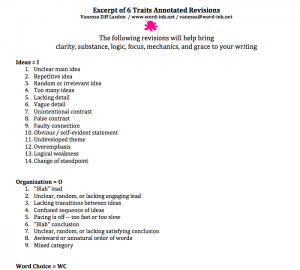 A thorough revision technique I developed that helps to bring clarity, substance, logic, focus, mechanics, and grace to anyone’s writing. Recommended for ages 11-adult. 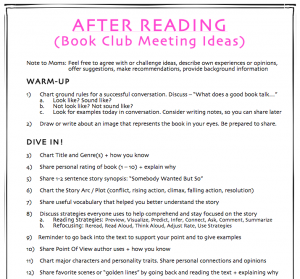 If you’re interested in starting a book club for kids or teens, I can provide a framework for discussion that includes reading strategies, conversation starters, and extension activities. 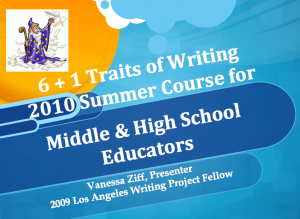 In this excerpt of my 4-session course available year round, I walk you through how to effectively implement the 6+1 Traits of Writing curriculum throughout your entire school year. 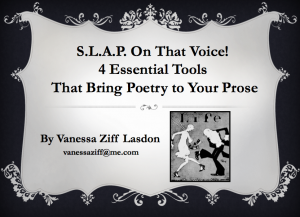 This excerpt of a teacher-oriented workshop I conduct shows educators how a sentence’s sound, length, punctuation, and arrangement can bring personality to any piece of writing. 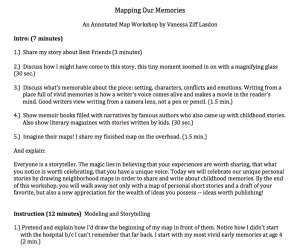 This excerpt for a workshop designed for both students and teachers celebrates our unique personal stories by drawing neighborhood maps in order to share and write about childhood memories. 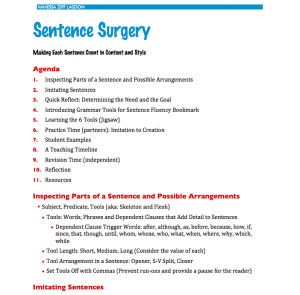 In this excerpt from a workshop specifically geared toward writers, you’ll see how through literary evaluation and writing exercises, we demystify SYNTAX so you can master it.